Abstract : The study of rock wall permafrost has only started ten years ago. The understanding of the role of permafrost degradation in rock wall instabilities must be firstly based on the knowledge of its spatial distribution. The difficulties in mapping rock wall permafrost result as much from its invisibility as its extreme sensitivity to local settings. Thus its modelling becomes an essential tool. 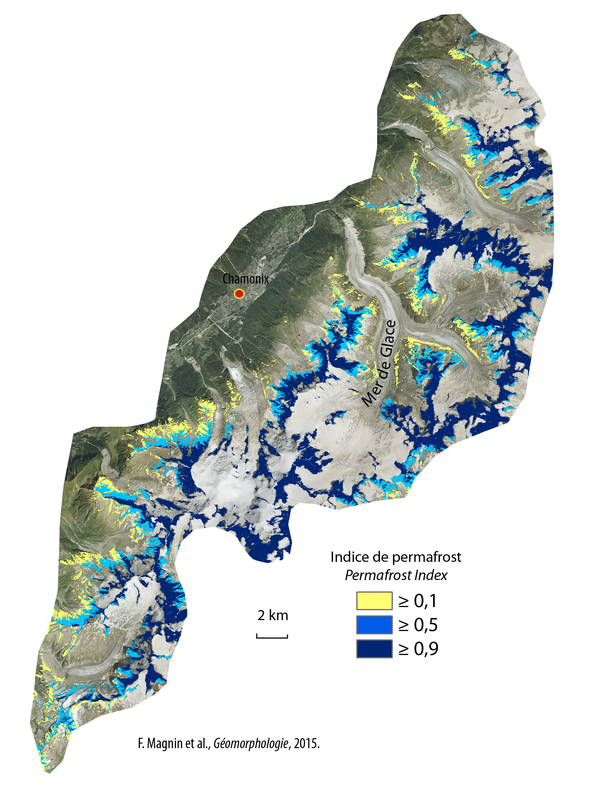 An empirico-statistical model built for the mapping of permafrost probability in the rock walls at an Alpine scale is here applied to the Mont Blanc massif, integrating local input variables with high spatial resolution. The importance of the spatial resolution for modelling rock wall permafrost is highlighted: differences in output temperature for the same model can reach up to 2°C between 4 m and 30 m spatial resolutions. 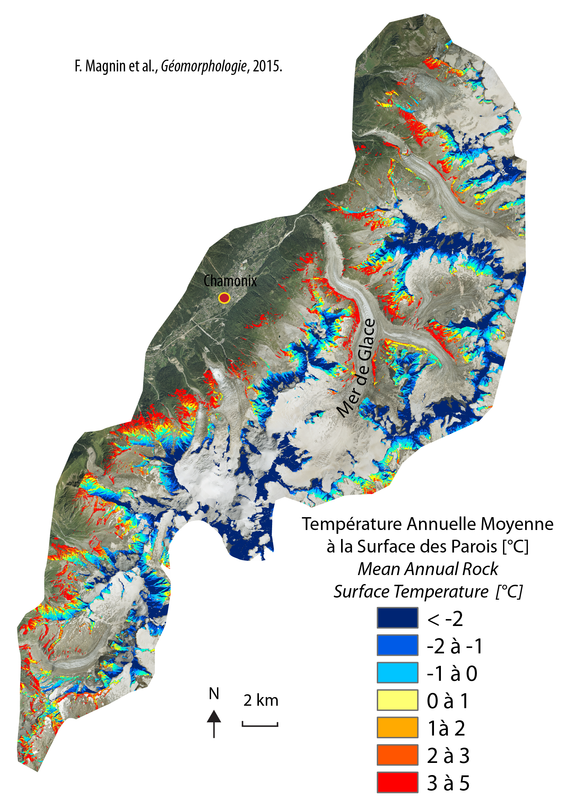 A map of the permafrost in the massif rock walls is proposed. 45 to 79% of the 86 km² of steep rock faces ≥ 40° would be underlain by permafrost. It would be present from 1900 m a.s.l in north faces and 2600 m a.s.l.in south faces in case of favourable local structural settings. Its presence would be more continuous from 2600 and 3000 m a.s.l., respectively, but it would occupy the totality of the rock walls, in any aspect from 3600 m a.s.l. 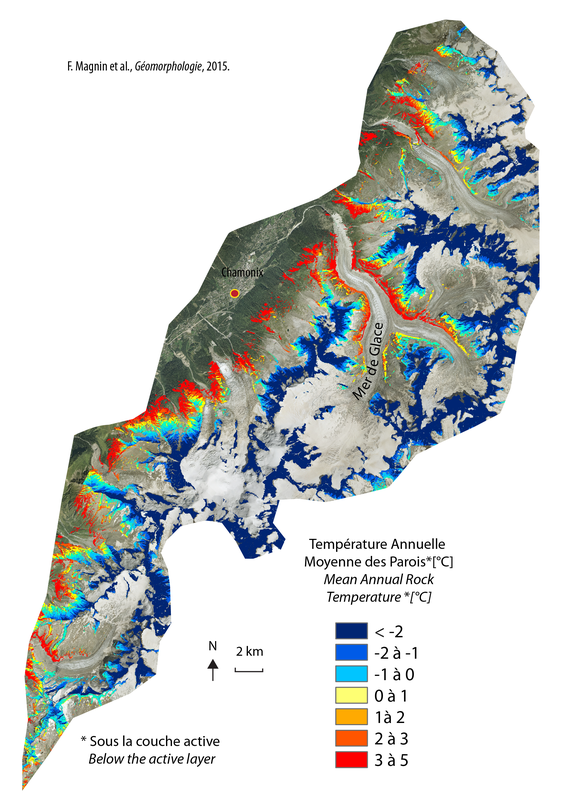 The interpretation of the permafrost index map requires the understanding of the effects of factors that are not taken into account in the model and that favour its occurrence beyond the topoclimatic control, such as fractures and snow cover.